Asked to name the quintessential British drink, it’s likely that you’d think of a pint of ale or a cup of tea. But what about London dry gin? At one time it really did come from London, and during the “gin craze” of the 18th century, the city’s backstreets were full of people making and consuming it. Nowadays most gin is produced by large distilleries outside the capital, but a small band of enthusiasts are bringing gin back to London. While the center of London is always throbbing with life, you don’t have to travel very far west down the Thames before you hit the quiet inner suburbs of Ravenscourt Park. Here, rows of Victorian townhouses perch in orderly terraces. It’s not where you’d expect to find a microdistillery, but behind a blue wooden door in the middle of this block is Sipsmith, makers of London Dry Gin. Inside Sipsmith’s garage-come-workshop sits the master distiller, Jared Brown. “Gin was born because King William of Orange, in around 1689, proclaimed that distilling would be a great way to use up the surplus of grain in the country,” he says. 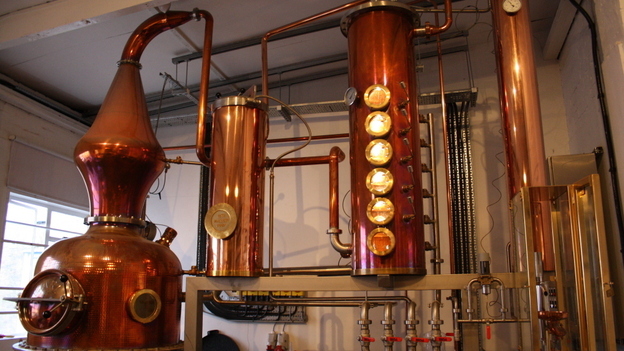 Brown moved to the U.K. with his British wife after learning to distill gin back in Idaho. He’s just finished writing a history of alcohol.